So the box was knocked up using some wooden pallets, bits of an old hardwood fence and some sheet plywood. This week we found that it wasn’t such a great idea. Most of the pine pallets forming the structure of the box had been eaten and destroyed by termites. 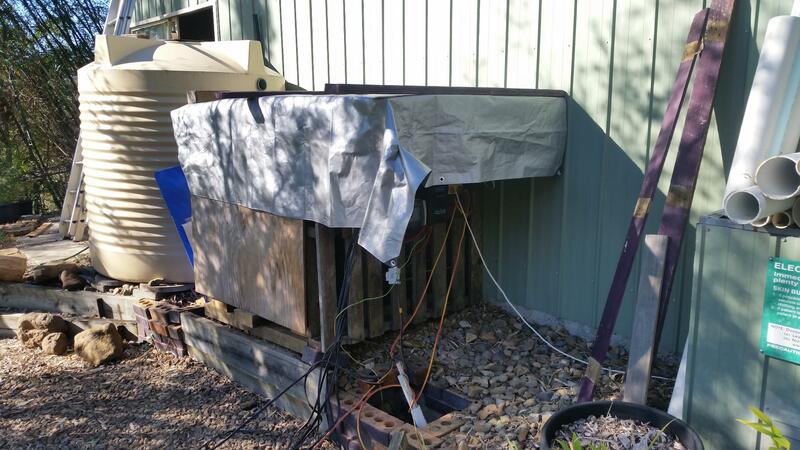 While this is not surprising for a wooden structure in South East Queensland, the extent of the damage in this relative short time was surprising. All the pallets had been destroyed. Any hardwood elements in contact with the pine that was eaten was also destroyed. 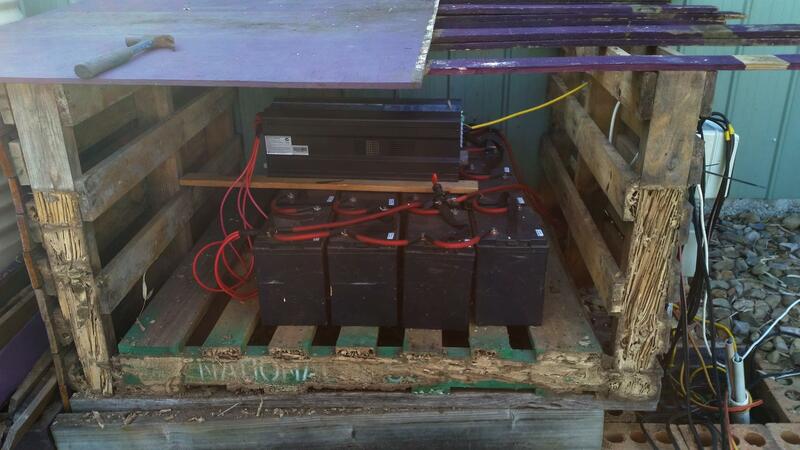 This included the pallet that supported the solar batteries. 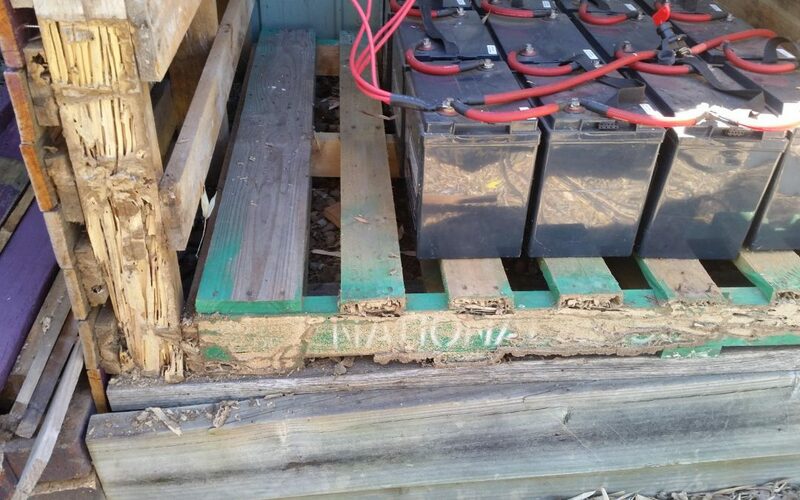 Each battery weighs 31kg and there are 16 of them – that’s almost half a tonne – sitting on this collapsing pallet. So we needed to deal with this immediately and rebuild the box. We still had some pallets that we had not used and had recycled from a previous use. So we created a ‘quick and dirty’ solar box from hardwood pallets, plastic pallets, treated pine sleepers and raw sawn treated pine. The aim was just to secure and reset the solar system, especially the batteries. Plans for a new permanent Solar Box are being designed now. Yep… it was/is ugly. But it is truly temporary. We will secure it further in the days to come. We also have had recent issues with the ‘New’ Solar System with the batteries not holding power. 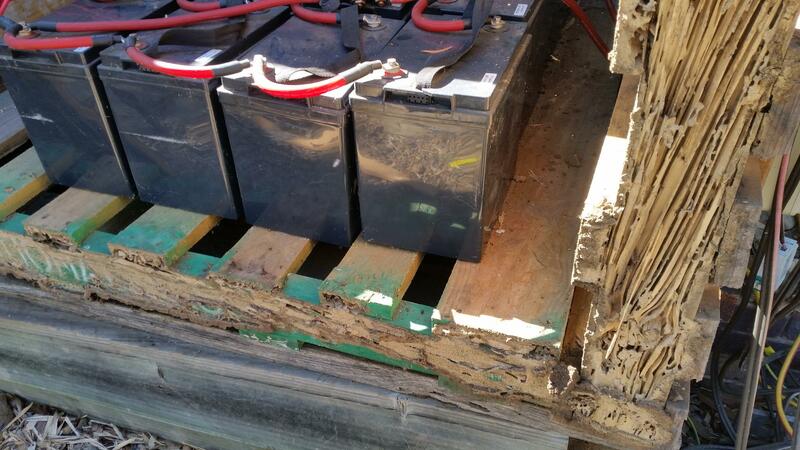 So this gave us an opportunity to inspect, clean and test our solar Batteries. But that is another story.